As you all know, I am really obsessed about challahs. It's a bit of a surprise I am not all challah'd out considering how many loaves I've baked in the last couple of weeks or so. I baked these stuffed challahs that were published in The Washington Post last week, all three, twice. The second batch which I baked at home went to our lucky neighbors, since I can't keep anything tree nuts in the house. I shouldn't have baked anything with tree nuts at home to begin with. I was so paranoid about tree nut contamination that I got rid of the half opened flours, leftover nuts and anything remotely in the vicinity, even the working surfaces. Yikes. I also baked three plain honey challahs. One three strand crown with half the batch, and two mini, baby three strand rounds with the other half. I just love the baby challah as others did here too. Add the yeast into 1 cup of lukewarm water and then a teaspoon of sugar and mix. Cover tightly with plastic wrap and let increase in volume and come to a bubble, approximately 20 minutes. Add the flour, remaining sugar and salt into a mixer bowl with hook attachment and mix on low for a few seconds. Add the yeast, oil, eggs and a half cup of water while mixing on low. Scrape sides of the bowl as needed. Continue mixing on low and add the remaining 1/2 cup water as necessary. Knead in the mixer on low for 10 minutes total. Scoop the dough out, cover with a film of canola oil, cover the bowl with a plastic wrap and set in a warm spot on the kitchen counter for an hour or until it doubles in size. Use half the dough batch above. Divide it into three parts. On a working surface roll out three long strands of equal length and thickness. Follow the braiding directions in the first chart above or get the same braiding directions appearing in the stuffed 3 strand Marzipan Almond Challah Crown version here. Preheat oven to 350F on regular, not turbo, setting. Let the challah proof on a parchment paper lined cake pan or cookie sheet, covered with a clean kitchen towel, for 30-40 minutes (do not over proof). Brush with an egg wash and sprinkle with sesame seeds. Bake in a pre-heated 350F oven, for 50 minutes until deeply golden, while rotating 180 degrees mid-way. 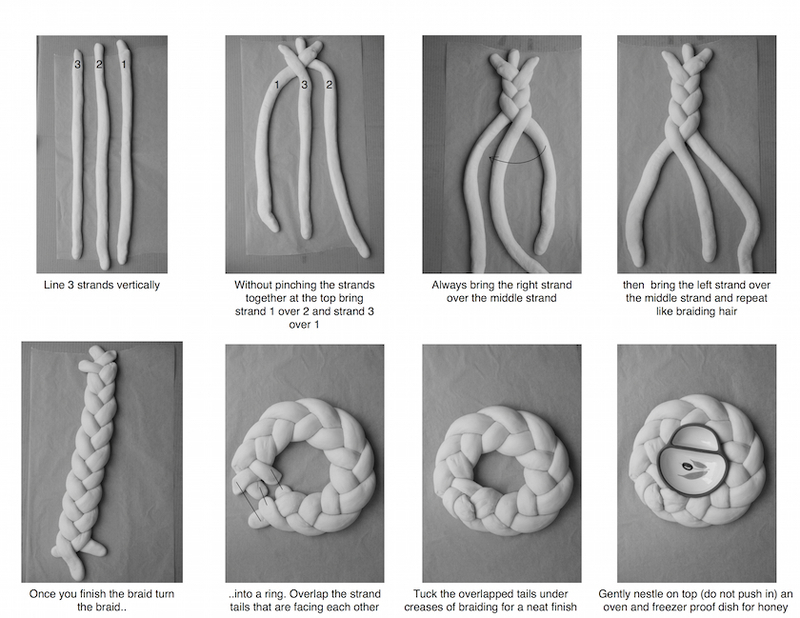 The chart above is also a step by step visual guide for the Marzipan Almond Challah Crown in The Washington Post here. Divide the remaining dough into half and each half into 3 parts. On a working surface, roll out three strands of equal length and thickness. Braid each set of 3 parts as shown in pictures 1-4 in the first chart above and continue as instructed in the second chart. If you wish to read the "snailing" directions for further clarification, you can access them in the four strand Fig, Olive Oil, Sea Salt and Spelt Challah here. Repeat with the remaining three strands. Preheat oven to 350F on regular not turbo setting. Let braided baby challahs proof on a parchment paper lined cake pan or cookie sheet, covered with a clean kitchen towel, for 30-40 minutes (do not over proof). Bake in a pre-heated 350F oven, for 35-40 minutes until deeply golden, while rotating 180 degrees mid-way. Serve after cooled down a bit, or at room temperature the day of, or freeze covered with foil first then plastic wrap. To reheat, place 10-15 minutes in a pre-heated 350F oven in foil only. Beautiful challas! I love the second style of braiding. I also love challahs so I'm all about this! It looks so pretty! I love the tutorial so great, these look awesome! What a great tutorial. Challah is one of my fav breads. This bread looks so delicious and I always wondered how to make it. Love your step by step. I am a visual learner so it really helps me! This is amazing, I love how simple you make it look. 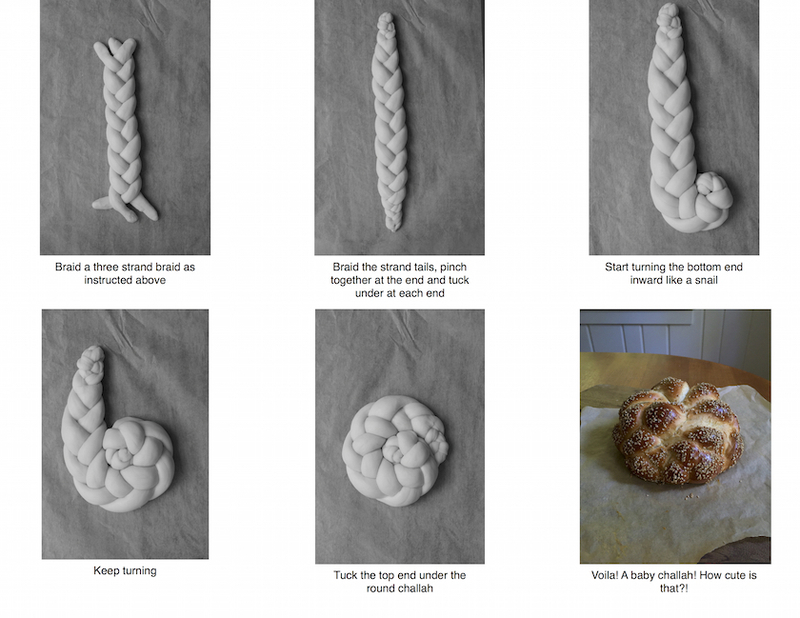 I love challah and this is a great how to. Plus those photos are just too pretty for words. I can't tell you how happy I am that you posted this! I've been struggling for a while and love the photos steps! This is such a beautiful post! I love all the step by step instructions and the pictures are so pretty! They're simply gorgeous. Your photos are so easy to understand! Fantastic job, Shulie!